If you are landed at this page then you must be trying to find out the best recumbent bikes for you. You should be delighted to know that you are in the right place. There are many exaggerated information on the ​Google. ​From this perspective, I can assure you none of my review is biased and painted. ​People take money from the companies and write biased reviews on the product. I have included both the cheapest and pricey products in this list based on their performance. So, even if you are in a low budget situation, you don’t have to be worried. I will help you to find out the Best Bikes for you. Go here to know more details​ about top exercise bikes. I have written and sorted the list of the recumbent bikes based on my personal experience and user’s experience. While creating the list, I have kept a couple of things in my head. The first one is pricing and the second thing is feature. If you are in a really tight budget, then nothing will be best than this bike. It offers you a comfortable ride all the time. There is a thing that I should mention before going deeper into this ​Smart Fitness Equipment's. If your budget is more than 200 dollars, then you should not look for this bike as it does not provide lots of features. So, let’s discuss about some features that exerpeutic 1000 recumbent bike provides. The dimension of this bike is 34 X 22 X 54 inches. The weight of this exercise bike is 63 lbs. The weight limit of this fitness bike is 300 lbs. Yeah; if your weight is in between 50lbs to 300 lbs., then you can use this bike with please. I have seen, most of the recumbent bike’s weight limit is 300 lbs. I don’t know the reason yet. They don’t provide facility for people who are above 300 lbs. There is a computer attached to this bike. There is a ​Small LCD Monitor in this computer by which you can track your workout data including speed, distance, burnt calories and heart rate. The company – Exerpeutic brand’s main office is located in southern California. 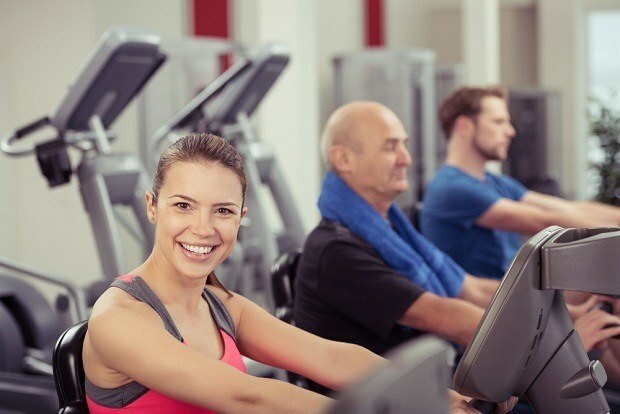 They have been manufacturing exercise equipment including treadmills, recumbent bike, exercise bike, Mountain Bikes, elliptical and playground equipment for years. Schwinn brand is so popular for their products with the customer. Schwinn the name itself is a brand. It is very popular brand for their products with the customer. The Schwinn 230 recumbent bike is really excellent and expensive one. This bike is good looking, stunning and breathtaking. So, if your budget limit is around 500 dollars and you want to buy a charming bike then this recumbent bike would be one of the best picks for you. 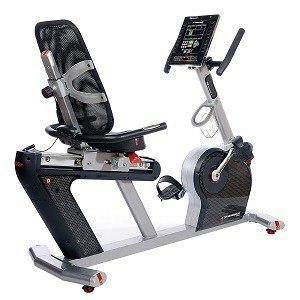 Click here to know details about Schwinn recumbent bike. I, personally recommend limiting your budget from 300 to 500. If your budget is lower, take a few months and gather the money. What I think about this stationary bicycle is , it does not cost much with respect to the features it is providing. Why am I saying this? Okay let’s have a look at its features. Schwinn MY16 230 contains about 22 workout programs which are customizable and user friendly. There are 20 levels of eddy current bike resistance which is calling ECB in the shorter form, for a wide range of workout intensity. There is a USB port in this exercise bike by which you can transfer data easily. There is a 3-speed fan to keep you cool and calm throughout your heavy exercise. Is not it cool? Schwinn 230 have also a water bottle holder to ensure that you can keep a water bottle into it so that you won’t get dehydrated ever during the exercise. 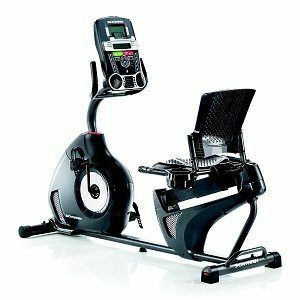 Dimension of Schwinn recumbent bike is 50 X 27 X 64 inches. This exercise bike is a bit heavy. It weights around 82 lbs. on the other hand the maximum user weight can be 300 lbs. 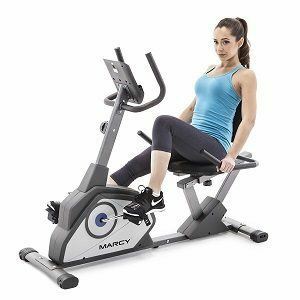 Marcy NS-716R is a fully adjustable recumbent exercise bike. This exercise bike has got a fully adjustable length so that it fits a wide range of individual users. You have to keep your legs and feet at a comfortable position to get the best result out of it. You have find out the position. Satisfactory in position differs man to man. One’s position and taste does not match other. So, you have to sort out which position gives you the ultimate satisfaction and pleasure. This is really a charm for the beginners. What I love about this product is , if you live outside of the U.S. then through amazon you can ship this product to your country. ​There are soft handle bars in this recumbent bike. It handlebars are covered with foam covers. A solid hold on the bike will let you make the most of each exercise session. Whats More About Marcy NS-716R Bike​? There is a digital tracking panel in this Marcy NS-716R exerpeutic bike. The dimension of this bike is 52 X 25 X 38 inches. The weight of this exercise bike is 56 pounds. There are some little drawbacks of this product. You won’t find any bottle holder in this recumbent bike. There are no preset programs as well. It was manufactured in a design so that it would be extremely easy for the beginner to use. It is really very easy to operate. Since it does not come with any preset programs, beginners won’t have to go through a hectic schedule. 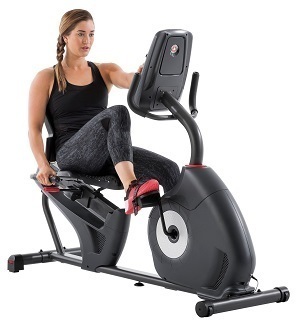 This gym bike is in the under 200 dollars category. If you are really in a tight budget then it would be a good pick for you. ​Diamondback fitness bike is solid, high-tech and well designed. Yes, the feature I love most about this bike is its stunning design. I don’t know why it gives me the feeling of a time machine. Seriously!!! This solid ​recumbent bike is 50 inches in height, 23 inches in width and 64 inches in length. The weight of this product is a bit higher than other ​exercise bikes. It’s 125 lbs. To get get details about Fitness Bike review, WorkoutGadget can be your best solution. Yeah, so the drawback is, it’s not that easy to move from one room to another room like other exercise bike. You need to have a fixed place for this beast even before buying this. There are 20 workout programs which are customizable. There are sixteen levels of ECB resistance for giving you a smooth experience. The handlebars of this exercise bike are adjustable. You can track your heart bit through the monitor. There are two cooling fans to make you relax during the exercise time. There is a source input by which you can play an iPod or Mp3 player. So, if you want to do exercises with music then this is a piece of hot cake. ​So, I think from the perspective of durability and lasting, nothing will be better than it. The design of this bike is unique as well. The sturdy construction of this bike gives it a stunning look. If you want to get a recumbent bike which will last for life time, I think this is one of the rarest bikes which you can think will last forever. ​This bike is made of heavy steel. It is so popular that it is considered to be one of the best recumbent bike. Marcy NS-40502R features with eight levels of resistance. The resistance level is lower than other competitors. But still it gives you a smooth experience. There is a tension-control knob which is very easy to handle. You will get a LCD monitor display on the exercise bike. This will help you to track some important data like as time, speed, burnt calories etc. There is another thing that worth mentioning, you can adjust the seat as per your height. So, if you are a taller person , you can place the seat in a higher position. The dimension of this bike is 57 X 25 X 43.5 inches. It weighs only 69 pounds whereas shipping weight will increase up to 71 pounds. As, there is a proverb, you won’t get everything from a product. For fulfilling this proverb, this bike won’t provide you some features. This bike is a bit pricey, but if you have a budget of 500 dollars to buy a recumbent bike then you will get this product easily. The price of these types of products changes too quickly. So, let’s know about the perimeters and specification first. The dimension of this recumbent bike is 64 X 27 X 50 inches. This exercise bike is a bit heavy as well. It weights around 82 pounds. But the weight limitation is 300 lbs. as usual. There is a short thing that I feel I write. Most of you do know this. But those who don’t know the difference between lbs. and pounds, I must inform you that both of these are same. Now, I am getting back into the old track. Schwinn bikes provide​ you the best possible lower back support during the exercise. You can perform challenging workouts from a relaxed position. I can bet this will give you the best pleasure out of all eights recumbent bike that are mentioned here. There are two integrated levelers and a center frame support for a sold workout platform. You will even find transport wheel beneath this bike. These wheels will make your transportation easy. If you want to keep your bike along with you all the time, more specifically if you want to carry the recumbent bike along with you then what will you need? 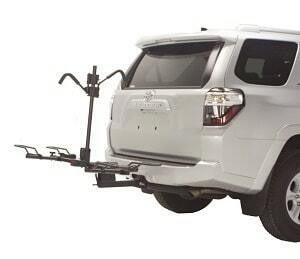 You need a hitch rack. You have chosen the best recumbent bike for you. Now you obviously need a hitch rack to carry the recumbent bike with you. You can carry up to two recumbent bikes with the help of this Hollywood racks. There is no seat interference. The color of this rack is black. It is 34 inches in length, 16 inches in width and 7 inches in height. The capacity of this rack is 100 pounds. So, you can carry 2 recumbent bikes with this rack which are 50 pounds in weight. This is one of the best recumbent exercise bikes. This one is a bit cheaper. It comes with a wide screen computer LCD display provides large numbers for easy viewing. The weight capacity of this product is a bit lower than average. We see most of the recumbent exercise bikes provide the maximum weight limit up to 300 lbs. but this one will provide you up to 250 lbs. weight limit. User height range is also limited for the users. Now, let’s talk about the features of this recumbent exercise bike. There are 3 goal workouts setting in this s﻿﻿﻿﻿﻿﻿﻿﻿tation﻿﻿﻿﻿ary ﻿﻿﻿﻿bicycle. 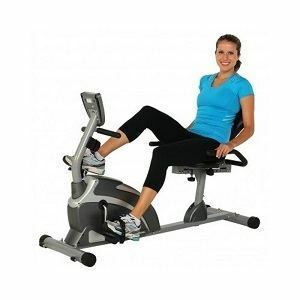 This exercise bike has durable and stable steel frame construction. There is 14 levels magnetic tension resistance in this recumbent exercise bike. There is extended cushioned seat which is really comfortable. The cushioned back rest will give your back some extra support. With the help of wheels you can transport with this bike anywhere you want. I love PROGEAR 555LXT Magnetic Tension as the Best Recumbent​​ Bikes in 2018.